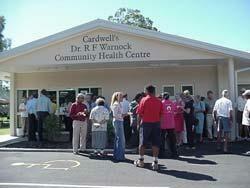 The Cardwell Community Health Centre provides nurse-led clinics from Monday to Friday. Medical services are provided by a private general practitioner practice co-located at the Cardwell Community Health Centre. Aboriginal and Torres Strait Islander health services include heath worker support in the community as well as a specific Aboriginal and Torres Strait Islander 'Mums and Bubs' group. Telehealth services are available, via video-conference, linking patients with specialitst services reducing the need for patient travel.